The Japan! Japan! Blog: Thanks! Again! Screen capture taken last October 29. It's another record month - my best month yet. Thanks to all of you for visiting and for coming back again and again! My pageviews have risen month-over-month since around June this year, to over 2,500 pageviews for October 2012. Prior to June, I've had an average of only around 400 pageviews per month since I started blogging my Japan 2.0 experience in April 2010. Wow. Thank you all, once again! If you can see from the stats above, many of my visitors came by way of the Japan Blog List. Welcome to all of you who clicked through JBL. If you haven't yet heard of JBL, go over there now and find out more blogs about Japan. It's at http://www.japanbloglist.com/. For your entertainment while you're in Japan, please do also check out my 2nd most popular blog, RAW (ronjie.com around the web), at http://ronjie-raw.blogspot.com/. You can also read through my Japan 1.0 experience from way back in April 2005, if you're interested. Links to the archived articles are below, but for a bit of nostalgia, you can check out how my blog looked like back in 2005 at http://ronjie-japan2005.blogspot.com/. 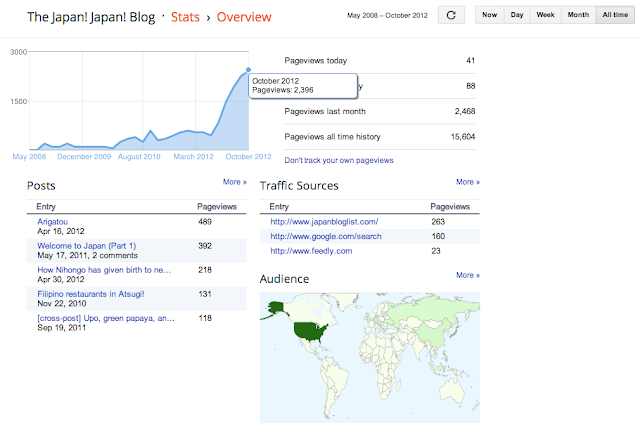 UPDATE: The final tally was 2,653 pageviews for October 2012. Sugoi!